One of the more common types of food allergies involves the consumption of dairy products, especially cow’s milk. There are people who just cannot consume it, and I am not just talking about infants and toddlers. Let me make one thing clear, though: lactose doesn’t play a role here. The issue with lactose does not involve an allergic response. Instead, lactose intolerance develops due to a frank or relative reduction in the enzyme lactase. This enzyme breaks down the milk sugar lactose so without it, undigested milk sugar can produce gas, bloating, and diarrhea. Under these circumstances, when this allergic response occurs, the immune system produces antibodies from specialized white blood cells called lymphocytes. These antibodies cause the characteristic symptoms associated with the milk allergy. Now, some recent evidence may indicate why people can be allergic to cow’s milk. Researchers at the Messerli Research Institute at the Vetmeduni Vienna, the Medical University of Vienna, and the University of Vienna recently discovered what makes cow’s milk allergenic to humans. The answer lies in a specific protein found in the milk called beta-lactoglobulin. This protein can become quite allergenic, especially when the iron it normally carries becomes dislodged from its protein structure. Under normal circumstances, this milk protein carries large amounts of iron and is not considered a threat to human health. When this iron is uncoupled with the milk protein, lymphocytes are activated and antibodies are produced consistent with the milk allergy. The really important next step for researchers is to determine what causes the loss of iron in these milk proteins and how to prevent it from happening. The lead investigator of this study, Erika Jensen-Jarolim, suggests that milk protein may be loaded or unloaded with iron depending on the manner in which the cows were raised. The degree of iron loading may very well depend on whether the milk is produced from organic or non-organic farming techniques. Free-range, grass-fed animals that are not exposed to drug residues may have naturally occurring higher levels of iron in their milk as opposed to commercially raised dairy cows. 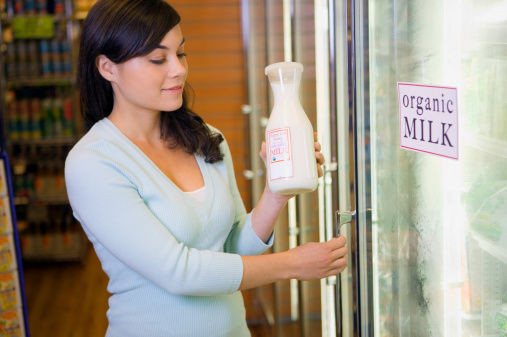 This may prove to be yet another reason to purchase your cow’s milk from an organic producer. “Why major cow milk allergen is actually allergenic,” Medical News Today web site, August 26, 2014; http://www.medicalnewstoday.com/releases/281497.php.